A charming yet modest 4-star hotel on the coast of Leghorn in north west Italy, the Hotel del Golfo is high quality yet understated. 29 rooms, a private beach and a wealth of other services and facilities make this a small gem of accommodation in one of Italy's lesser known destinations. The Hotel Golfo wanted a website that was a cut above the rest, something in keeping with the 4-star hotels of Rome and Florence, and that's exactly what it got from its collaboration with Fisheyes. The plan was to build an original website with features way above and beyond the bar of expectation. 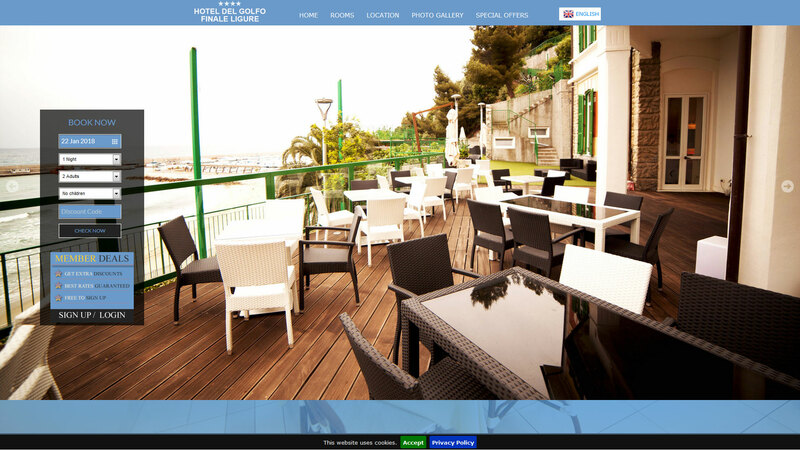 Fisheyes integrated the hotel into its plethora of portals and gave the official website the full treatment, squeezing all of the finest features into five simple pages in ten languages. The site enabled the CH Hotels Group to open up and communicate effectively with its customers and make optimum use of the features offered by the WebHotelier system. An original and visually striking website whose simplicity and modesty matches that of the hotel yet, like the hotel, packs more punch than it lets on. Highly visible, highly comunicative and highly responsive, the Del Golfo's investment has paid off in terms of conversions and ultimately, profits. The successful partnership between the Hotel del Golfo and Fisheyes has resulted in yet another hotel increasing its turnover every single year since the collaboration began, accessing previously untouched markets and utilising the Fisheyes marketing machine to its maximum potential.